Menulog delivers for Bekya so you'll be able to track your courier on a map. Green peppers, turnips and cucumbers. Hummus, Baba ghanoush and labaneh. 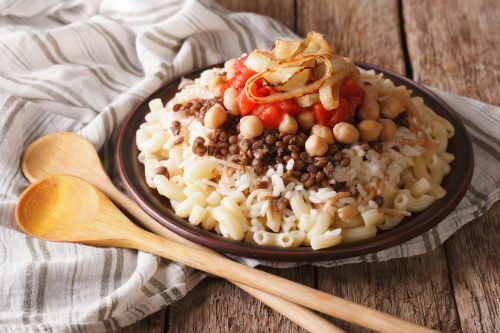 Rice, lentils, macaroni, chickpeas, crispy onions and spicy tomato salsa. Fava beans, green herbs and tahini. Lightly fried cauliflower, sumac, za'atar and tahini. Filo pastry and Halloumi cheese. Rice, onions, parsley, tomato and chickpea. Spiced lamb mince, crushed wheat, pine nuts and onions. Lettuce, tomato, shallots, radish, parsley, pomegranate dressing and crispy bread. Tomato, red onion, cucumber, parsley, extra virgin olive oil and lemon juice. Halloumi, roasted beetroot, cauliflower, sweet potato and red cabbage salad. Grilled chicken breast, lemon juice, garlic sauce and parsley served with Egyptian rice. Skewer of chicken, kafta and beef, dips and salad. Sauteed green beans, cherry tomatoes, garlic, chilli and Dukkah.